school bus? We can help! 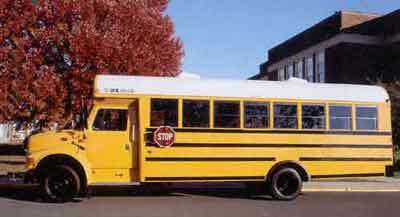 For many years, U. S. Bus was a significant producer of small school buses, but that all changed when they ceased production around the year 2005. U. S. Bus built a number of different Type-A models over the years. The model shown at right combined advantages of Type-A, B, and C buses with capacities of up to 48 passengers. It had a flat floor (no rear wheel housings) and that made it easy to install tracks for seats or wheelchair restraints. We have part numbers interchanged in our database, so we can help you find the part you need very quickly. When you call, please give us the last 8-digits of the VIN number so that we can lookup your bus in the computer system.